A selection of images of some of the projects we have undertaken recently. These images are chosen to illustrate both the breadth of the works we undertake and the skill set we possess. Detail from a Japanese style water garden designed and built by us in Hampshire. Japanese style pond and waterfall. Splash! A green oak based waterfall and stepping stones in West Sussex. Rill, small falls and a pond on the day it was completed - the filtration system still has a bit of work to do! 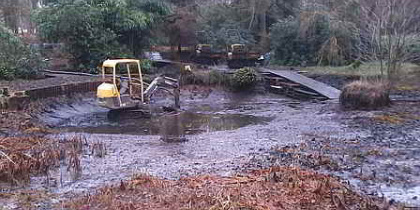 Silt and vegetation removal from an on-stream pond in Surrey. We diverted the stream and built temporary bridges over a stream to enable us to deposit the arisings in adjacent woodland. All work in the pond was carried out on bog mats to protect the pond base from damage. It rained a bit during this silt removal exercise - actually it didn't stop for about five weeks - neither did we! And we left the site looking as good as it looked when we got there - NO MESS. We are always very proud of the way we look after the gardens and grounds in which we work. Fixed jetty and floating pontoon. Jetty sub-structure is of recycled plastic lumber so it will never rot away. This is a rescue job - a tiny koi pond that was being built by others - there is a "before" image on this page to illustrate why the rescue was necessary. A small "koi pond and waterfall" construction BEFORE Naiad Pond Services came to the rescue. 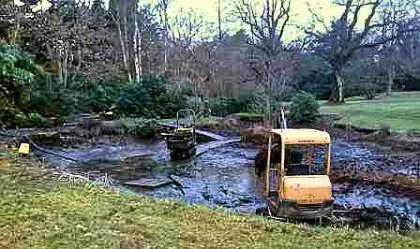 The resulting rescued pond is illustrated elsewhere in this gallery. Wildlife pond (about one year old here). 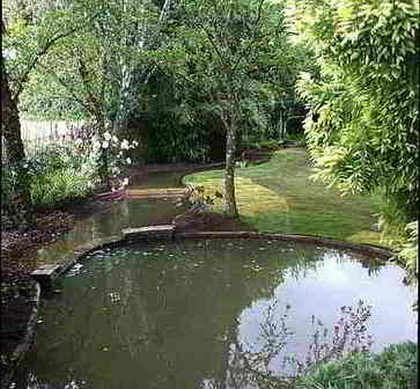 Two sets of other contractors had tried to build this lined pond and failed - the ground was difficult to work with but our 35+ years experience in all types of pond work meant we could take the challenges in our stride; we make no apologies for being proud of our abilities. Green oak timber revetment at pond rim. We converted this outdoor swimming pool (under a magnificent Magnolia) into a pond - the finished article is illustrated elsewhere in this gallery. 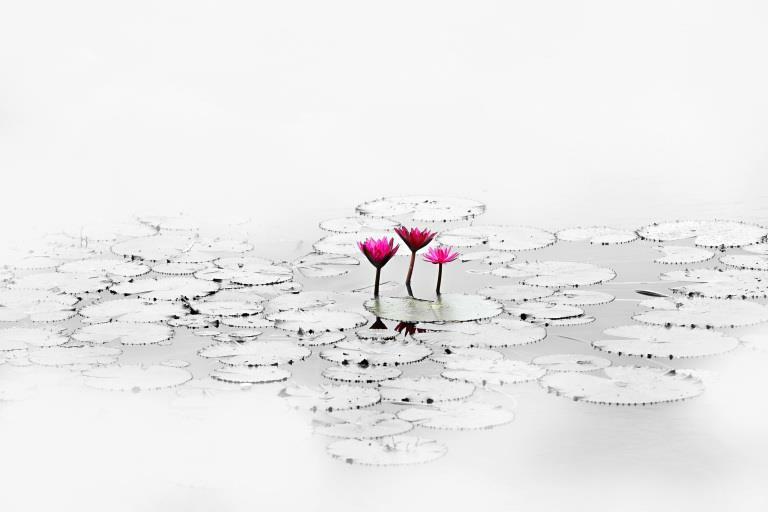 We refurbished this defunct, leaking, Roman ended, concrete lily pond - empty when we first met it. The beautiful Yorkstone paving surround was also the worse for wear.